- The FIELDMASTER compact Harrow used in open farm workings for the superficial ploughing, for the shatter of clods, preparation of soil for sowing, burial of organic substances and remains. - To air the soil and eliminate the weeds. - For breaking the roots. - It can be used in light and medium soil. Relying on our wide experience and knowledge in this sector. we are counted amongst the top most leading and reputed manufacturers of Harrow Plain Disc. These are known for their superior performance and rugged design. With our rich industry experience in this domain we are able to manufacture a vast assortment of Notched Harrow Disc. Our company is recognized as a reputed Manufacturer, Exporter & Supplier of Ox Harrow from Ludhiana, Punjab. Our Ox Harrow is highly efficient, easy to maintain, and requires less maintenance. 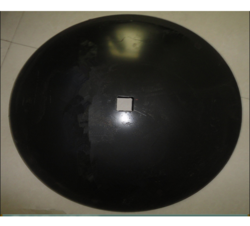 We are manufacturer and exporters of harrow discs made from EN 45 grade material which is equivalent to SAE 1070. Our discs are made from the cross roll process which results in high efficiency and durability. We are manufacturing discs from 14" to 28" Dia with the thickness from 3mm to 8mm. These harrow disc are made from very high quality raw material which ensures high durability. Our harrow disc widely finds its application garden tools. We are the manufacturers and exporters of Harrow Discs. For Liquid Manure without Fibrous Material. : Operation Each disc injector is connected to a hydraulic cylinder in order to better follow the contour of the ground. This way, each injector adapts to uneven ground while maintaining its working depth with no effect to the other injectors working depth. We are manufacturer and Exporter of Harrow Disc Blades.